viasGATE is used to trigger state of flights in the connected FIDS/AODB. The viasGATE is a webpage that is used to issue gate commands etc. to flights. The commands could be “Go to Gate”, “Pre-boarding”, “Boarding” or “Gate Closing”. The webpage contains a number of groups of buttons. The groups and buttons are all configurable through an administration webpage. The groups and buttons can be changed in realtime. For each button you can define a number of different commands to be issued, for each command you must define a priority and a condition. The condition must be an sql statement that can be evaluated against the database. If the evaluation is true the configured command is executed. The commands must be an SQL statement that can be issued against the database. During installation of the page on the terminal it is given the gate ID in a configuration file. This is then used by the software to show which flight is currently assigned to the gate in the connected backend system (FIDS or AODB). In the example the viasGate web-page is configured to run at the gate 4 counter PC. The system then knows that flight SN3128 is assigned to the gate and that it is delayed to 11:38 local time. 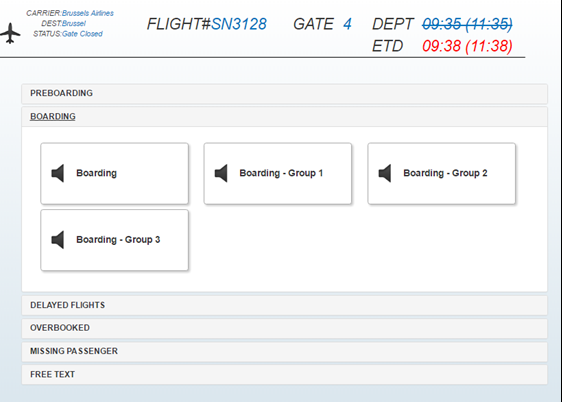 In this case there is defined 6 groups of buttons and under the “boarding” group 4 buttons are defined. 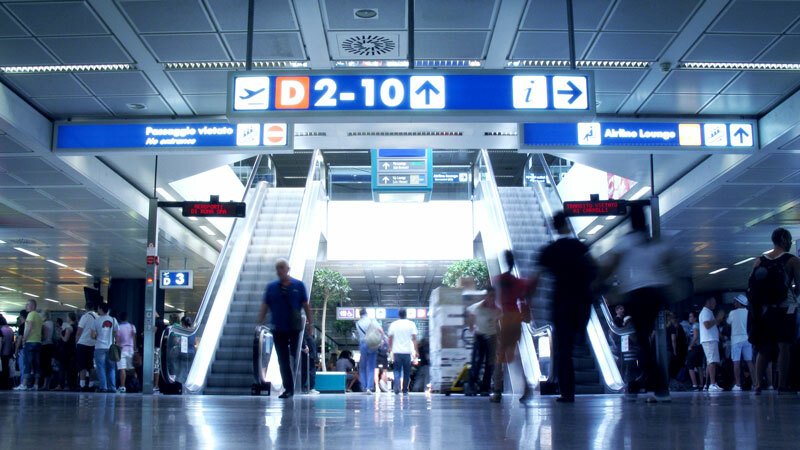 Pressing on of the “Pre-boarding” buttons could enable a text on the monitors telling about how the passengers should react under this preboarding. The text could either be written directly in the SQL command of the button or the SQL command could just contain an update of a state variable for the flight. Groups of buttons for different types of operations. Configurable actions, can be changed at any time. The Action depends on set of conditions. As an example: Actions can be diferent for different airlines, or depend on aircraft type etc.